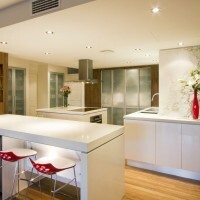 Australian kitchen designer Kim Duffin from Sublime Cabinet Design has sent us a practical contemporary kitchen renovation project he has completed. 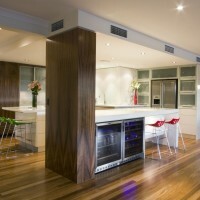 Kim Duffin has created a practical and attractive kitchen customised to suit the lifestyle of the resident family. This well-considered design incorporates clean lines, defined pathways, and a designated home for every appliance ,food stuff and utensil, Sublime Cabinet Design have helped make the daily tasks of cooking and cleaning much easier. 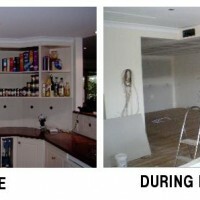 To achieve the new free-flowing layout, several walls were removed to the adjoining living areas to open the kitchen up to the rest of the home. This has created an environment for casual dining and interaction with family and friends as well as cooking and food prep. 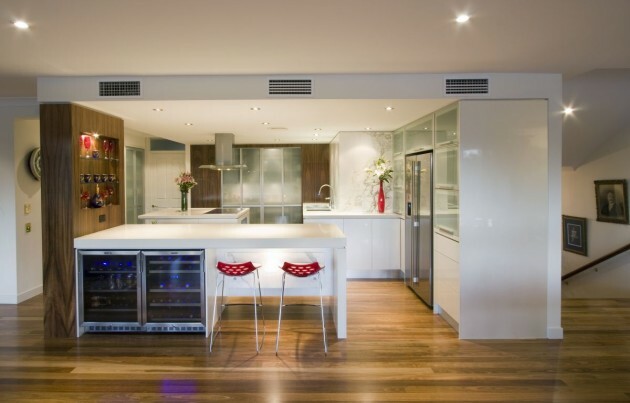 A large island bench at the front of the kitchen doubles as both a food serving and dry bar area, providing the perfect spot for informal entertaining with a beverage centre neatly positioned underneath. In order to blend the kitchen with the existing décor of this renovated Mediterranean style home, earthy tones and natural materials were chosen to complement the existing surrounds and work with the home’s waterfront position. 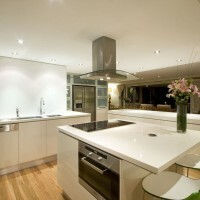 Marble splashbacks, quartz stone bench tops and a new floating floor in spotted gum have helped create harmony between the kitchen and living areas. Walnut veneers provide an eye catching focal point, bringing warmth to the overall design and also masking a structural support for the roof .Naturally; storage was a priority in this project. Drawers were introduced in lieu of cupboards to provide a more ergonomic use of space and have been designed to incorporate specific needs. All drawers and floor cabinet doors can be touch-opened, producing clean lines and providing greater convenience when the resident cook has their hands full. 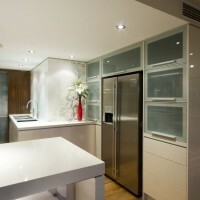 To minimise clutter, an appliance pantry has been incorporated, which features sliding glass doors and movement sensor lighting. 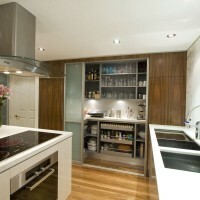 This pantry provides a concealed practical space for all food and appliance storage requirements. 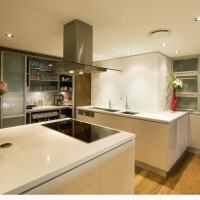 Lighting is one area which is often overlooked in kitchen design, but not here. Task lighting is provided via down lights to illuminate workspaces and low-wattage accent lighting helps enhance the key elements of the design. The kitchen doesn’t skimp of environmental consideration either, with the products used throughout carefully selected for their low Formaldehyde emissions. In addition, the walnut veneer was derived from plantation managed forests. Visit the Sublime Cabinet Design website – here.